Come and enjoy an afternoon with friends, food, and music! Power of ten and Padres Unidos de East Ramapo will honor three champions of our struggle for quality education for the children of East Ramapo. 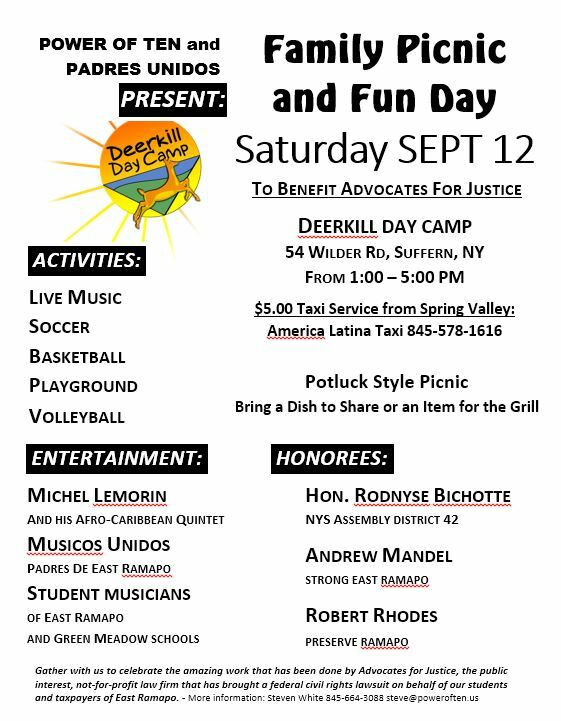 We will celebrate the amazing work that has been done by Advocates for Justice, the public interest, not-for-profit law firm that has brought a federal civil rights lawsuit on behalf of our students and taxpayers of East Ramapo, and help them to raise some much needed funds. Honorees: Hon. Rodnyse Bichotte, NYS Assembly District 42; Andrew Mandel, Strong East Ramapo; Robert Rhodes, Preserve Ramapo. Entertainment: Michel Lemorin and His Afro-Caribbean Quintet, Musicos Unidos – Padres de East Ramapo, Student Musicians of East Ramapo and Green Meadow Schools. $5.00 Taxi Service From Spring Valley by: America Latina Taxi 845-578-1616. Potluck Style Picnic: Bring A Dish To Share Or An Item For The Grill. Activities include Live Music, Soccer, Basketball, Playground, Volleyball. Georgine Hyde, whose legacy epitomizes what a school board trustee should be, passed away on August 28, 2015. She served from 1969 to 2005, when the growing ultra-orthodox bloc vote ousted her and took control of the district.